Russian proxies significantly increased the number of mortar attacks in ATO zone yesterday having fired almost 100 mortar round of various calibers at Ukrainian troops’ positions. “In total, the enemy conducted 53 attacks along the entire contact line. Ukrainian troops returned fire in most cases using weapons not proscribed under Minsk agreements,” reported Ukrainian Ministry of Defense spokesman on ATO Colonel Andriy Lysenko at a press briefing at Ukraine Crisis Media Center. In Luhansk sector, pro-Russian militants committed 14 ceasefire violations yesterday. “The most incidents took place at the approaches to Novozvanivka and Novotoshkivske where the enemy used 82-mm mortars twice. Moreover, militants shelled ATO troops’ positions near Krymske and Popasna with 120-mm mortars,” said Col. Lysenko. Russian proxies also attacked Troitske, Novozvanivka, and Novooleksandrivka at night. Ukrainian troops returned fire three times. In Donetsk sector, militants violated the ceasefire 32 times. Russian proxies attacked ATO troops in Avdiivka with 82-mm mortars and grenade launchers. “Our positions near Luhanske, Maiorsk and Kamianka came under dense grenade fire. The enemy shelled our strongholds near Pisky with 120-mm mortars and IFV weapons, and fired twenty 120-mm rounds near Troitske,” elaborated Col. Lysenko. In most cases, Ukrainian troops returned fire. The fewest hostile attacks were recorded in Mariupol sector yesterday. “The enemy used 82-mm mortars near Hnutove first in the morning and then in the evening. Militants used 82-mm mortars during attacks. Moreover, they attacked the outskirts of Starohnativka with small arms,” said the spokesman. 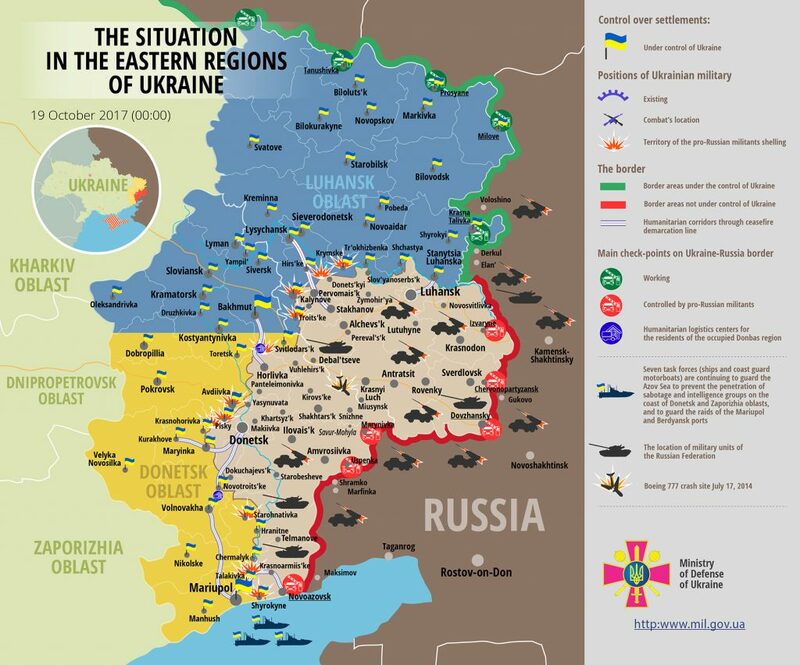 No Ukrainian serviceman was killed in action yesterday, but three were wounded as a result of hostilities. Report on the military developments as of October 18 is available here. Interactive data on the shelling: chronology shelling chart and the interactive map.